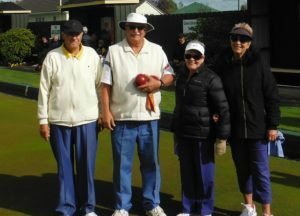 At a recent tournament at Fendalton Elmwood Park kept up its winning ways by taking the top three places. 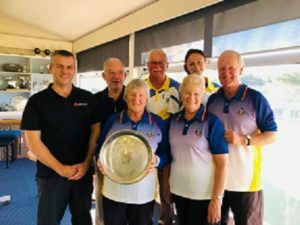 An outstanding result for Elmwood Park at the Fendalton Mixed Pairs Tournament. Finals Weekend. April 13 – 14 @ Woolston Park. This was another sea of blue and gold. Another successful finals day. Well done to all participants. Four titles and three runners up is a great achievement. 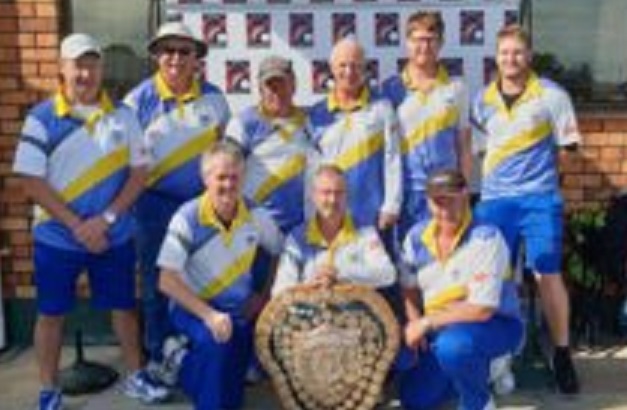 Congratulations to our men’s Watson Shield team which won this premier men’s event 3-1 over a strong Rangiora team. After a slow start, Gary Lawson, in the singles, played superb bowls to win his game 25 – 18; Steve Ditfort and Liam Eathorne lost in a tight pairs game, 15 – 20; the triples team of Paul McKinnel, Dave Vujcich (again filling in for Don Baker) and Neil Johnstone got out of the blocks with a significant lead which they held on to wining 26 – 18; and the fours team of Rod Greaney, John Mears, Mat Bassett and Ian Rule were always narrowly in control of their game, playing great bowls to win 20 – 13. Thanks also to Jonathan Flint and Bruce Humphreys for significant performances during the year in this team. Since the Watson Shield has been the premier men’s event, Elmwood Park has won it 3 years out of 4, a magnificent effort. Bev Morel and Sherrie Cottle went down to Allenton, 19 – 21, in the women’s pairs final. 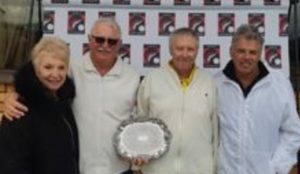 Our Over 60’s Fours team of John Mears, Dave Vujcich (substituting for Don Baker who was ill), Bruce Humphreys and Lois Grey won the title in a nerve-wracking finish. After being 17 – 0 up halfway through the game (16 ends) against a strong Halswell side, the game completely turned around and the last end commenced with our team being only 2 up. 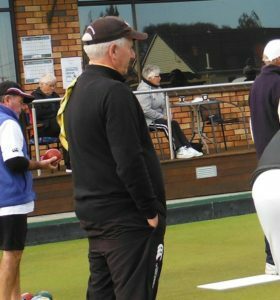 John Mears bowled the last bowl of the game with his team 3 down on the head, but produced a superb draw shot to get second shot and win the game. 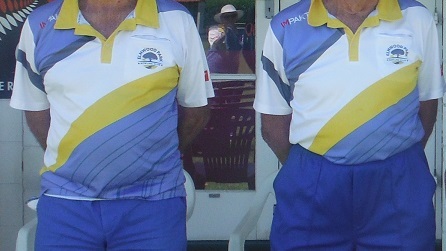 Congratulations to Stephen Ditfort and Ian Rule who defeated convincingly Leeston 18 – 7 in the men’s pairs final. 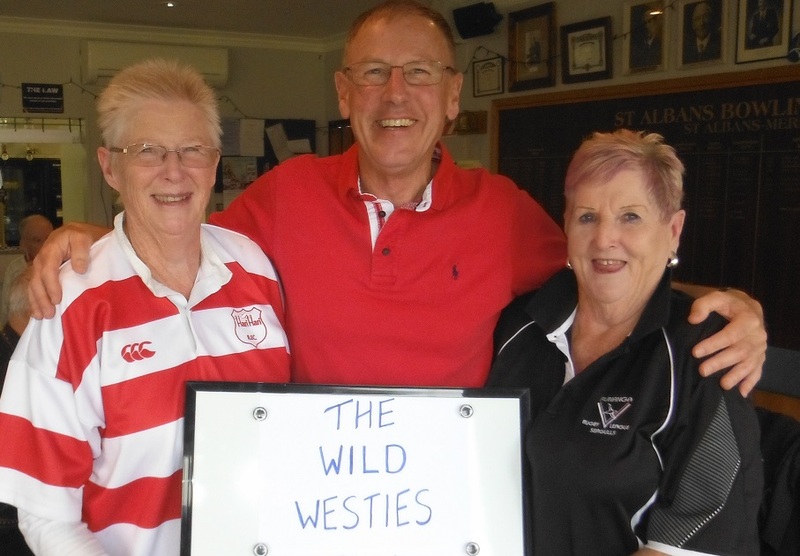 Bev Morel, Sherrie Cottle, Chris Kibblewhite and Fiona Frew lost 14 – 15 against Woodend in the women’s fours final. 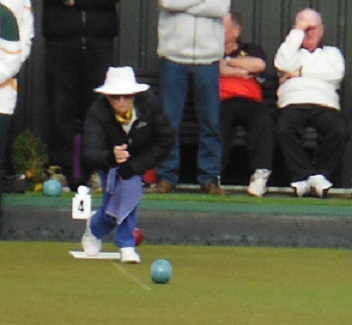 Tania Woodham went down 13 – 21 to Jenny Anderson of Woodend in the women’s U8 final. A meritorious effort as Tania played with an arm in a sling. 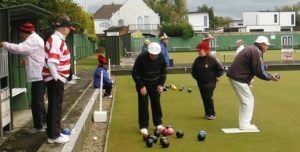 Rodney Greaney, representing Allenton, lost the men’s triples final, 10 – 21, but won the men’s singles final 21 – 14 against Belfast’s Mark Young. 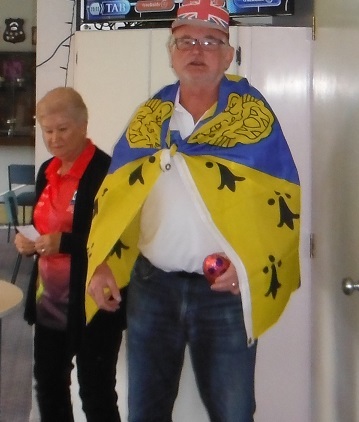 Rodney played for Elmwood Park in interclub this year, his bowls have been exceptional all season. Winners of the first Centre Mixed Fours title, a comfortable win over Noel Alexander’s Rangiora team 22 – 10. John Mears, David Vujcich, Theresa Woodham and Lois Grey. This was Dave Vujcich’s first Centre title. What a season is had been for the Elmwood Park Bowling Club, both pre and post Christmas with unprecedented success. 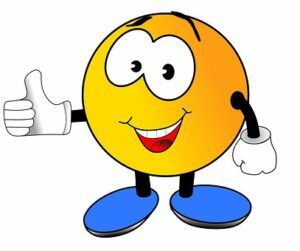 It should be noted that the Club has won all of the specifically mixed events showcasing the strength of both men and women in the Club. Further the Club has won two of the four Premier events, the men’s Watson Shield post Christmas and the Women’s Pennant Fours prior to Christmas. Skip Bev Morel in action in their semi final win against Belfast. 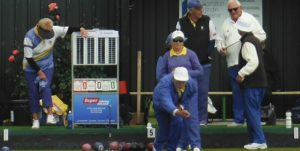 Pairs semi final, Stephen Ditfort and Ian Rule v H Wilson, Burnside and Bev Morel and Sherrie Cottle v D Harper, Parklands. Two Elmwood Park teams battle out the Over 60s 4s semi final John Mears, Bruce Humphreys, Lois Grey and Don Baker v Dave Vujcich, Neil Johnstone, Mary Ann Johnstone and Pam Phair. 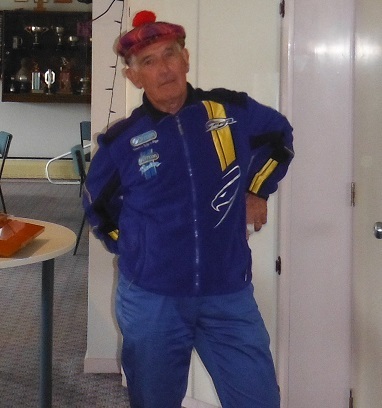 The John Mears team won. Skip John Mears was outstanding in this win. Tania Woodham also won her U8 semi final. On loan to Allenton. 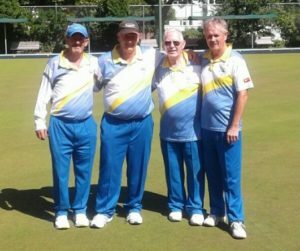 Rodney Greaney had an outstanding afternoon with wins in the men’s triples semi final and the men’s singles semi final. 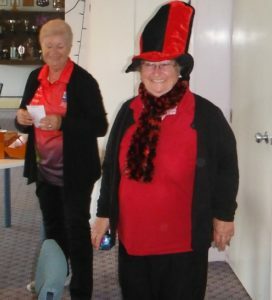 The final day of the club bowling season, the State of Origin. 8 teams of 4 played in conditions that gradually improved as the day progressed. 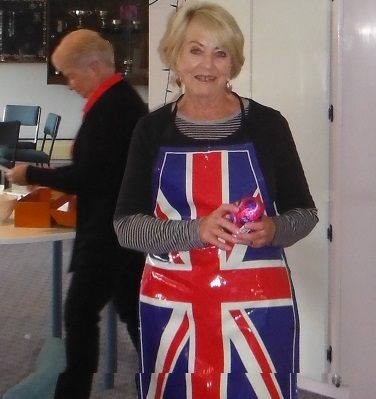 It was a fun day and culminated with a nice afternoon tea. Upon arrival with the weather being a little unpleasant, a general feeling of “Let’s not play”was very apparent. However the decision was made, one game of eight ends it was which became ten ends halfway through the game. President Pam thanked members for their participation today and said what a successful year it has been. Congratulations to Elmwood Park who won the inaugural Canterbury Premier League title. Participants were Steve Ditfort, IanRule, Rodney Greaney, John Mears, Gary Lawson, Mat Bassett, Liam Eathorne and Paul McKinnell. 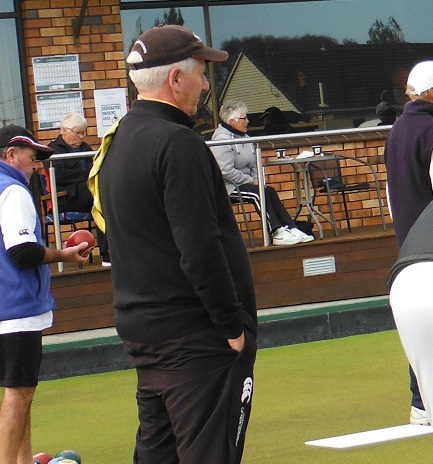 MuzzaWeb believes one of the reasons for this league was to give quality competition among some of Canterbury’s elite bowlers. 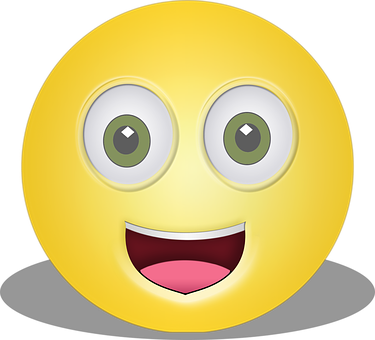 It is hoped to run the league again next season. Congratulations to Dave Vujcich and Erin Hyde who won both sides of the draw to win the handicap pairs. 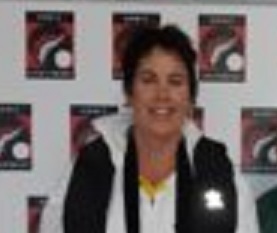 Congratulations to Tania Woodam who defeated Erin Hyde to win the club’s U8 women’s singles. 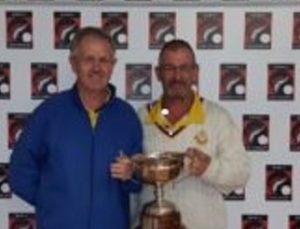 This is the 9th time that Steve and Ian have won the pairs title and the sigles title marked his 23rd club title. This is the third title for Stephen this year and he joins Bev Morel who also has won three titles this year. 17 – 3 – 18. Congratulations to Bev Morel and Sherrie Cottle who defeated Mary Ann Johnstone and Mary Ellis 22 – 10 in the women’s club championship pairs. This was Bev’s 28th club title. 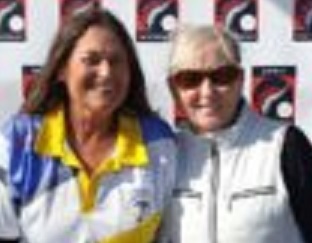 Congratulations to Bev Morel who defeated Chri Kibblewhite 21 – 15 in the women’s club championship singles. 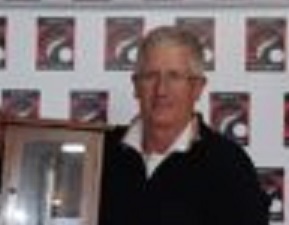 Congratulations to Luke Vujcich who won the handicapped singles with Mike Stewart runner up. Luke Vujcich was defeated in the first round of the champion of champions 1st & 2nd year men’s singles. Congratulations to Chris Kibblewhite, Fiona Frew and Theresa Woodham who won the women’s club championship triples by defeating Bev Morel, Sherrie Cottle and Mary Ellis 18 – 11. 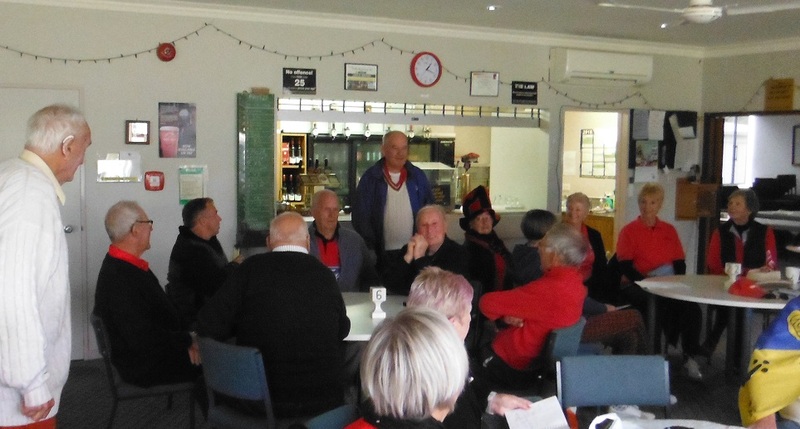 The John Mears and David Vujcich fours teams played in the Centre O60 fours at the Centre Green on today. Both teams qualified and will face each other in the semi final on finals weekend. Teams: John Mears Bruce Humphreys Lois Grey Don Baker and Dave Vujcich Neil Johnstone Mary Ann Johnstone Pam Phair. Well done to Bruce Humphreys who defeated David Grice 21 – 19 in the U8 championship final in a thrilling game that went right down to the wire. Bruce was holding shot on the final end and the drive by David missed by millimetres which would have given him the win. A great effort from both players. The team of John Mears, Dave Vujcich, Lois Grey and Theresa Woodham have reached the final where they will play Noel Alexander, Rangiora, on the finals weekend of April 13 – 14. Congratulations to all the participants, a great effort. Congratulations to Luke Vujcich who defeated Chris Littlewood for the men’s 1st & 2nd year title. 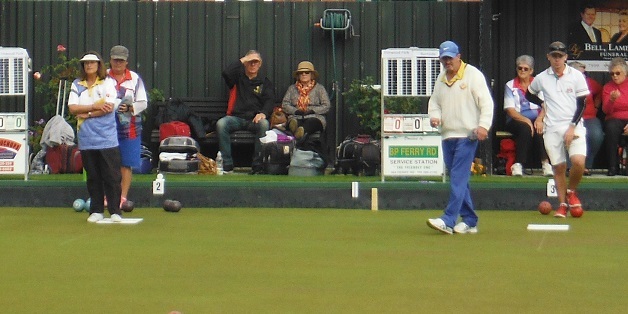 The final of the men’s championship fours was played at Heaton Street which resulted for a win to the Rod Greaney four against John Mears 17 – 14. 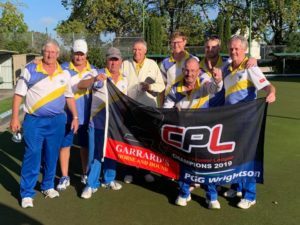 It was an enthralling and close game and only some superb pressure bowling in the last three ends by skip Rodney Greaney meant his team held on. 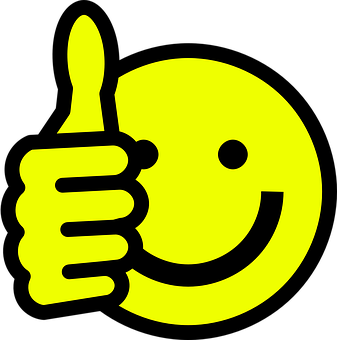 Congratulations to Rodney Greaney, Stephen Ditfort, Ian Rule and Peter Morel for their victory. 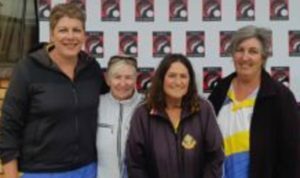 Congratulations to B. Morel, S. Cottle, C. Kibblewhite and F. Frew who won the women’s club championship fours.